Following on from an earlier article on Myths and Old Wives Tales, and also a common topic on various forums, I return to the issue of power loss when converting to LPG. I still maintain that a significant cause of the “you always lose loads of power from LPG conversions” stigma comes from the many poor conversions that have been done over the years. Getting the mixture wrong and getting the timing wrong will both have a significant effect. There are however some issues that are worth considering, and first of these is the restriction of the intake caused by sticking a mixer in it. 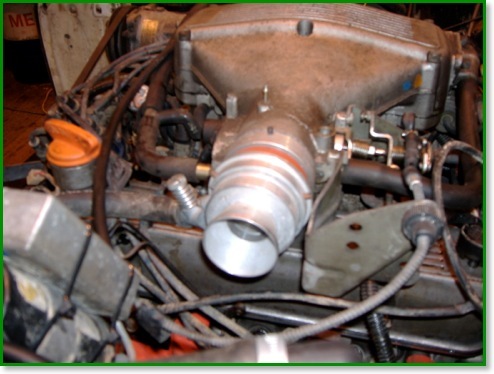 Looking at the picture above, and also the title picture of the linked article, it’s clear that the air is forced to flow through a significantly smaller hole than the throttle body. It’s bound to have an effect, though if you don’t have the throttle wide open (pedal on the floor) then it’s not the limiting factor - and even with 2 tons of vehicle with the aerodynamic of a small bungalow, and ‘only’ 3 1/2 litres of V8, I find this isn’t a significant amount of my driving time. On my list of things to do is a comparative test - petrol without the mixer, petrol with the mixer, and gas - but my list is long and this isn’t near the top of it so don’t hold your breath ! This effect won’t be present on an injection system, so that is another potential selling point for those. Lower partial pressure of oxygen. Propane takes up about 4% by volume of the intake charge vs about 1.72% for petrol - thus there is about 2.3% less oxygen going into the cylinders. Intake cooling be evaporation of petrol which increases the density slightly, an effect not present with propane which is already vapourised. The page does not quantify this effect. Slightly below this, the page mentions tests run by GM which showed about 8% difference between petrol and LPG. Whilst the lost 10hp (about 8% of the 3.5 V8 nominal power) would be nice to have, I’ll live with it for the lower running costs !